Well, I have to say that my spending ban on all things makeup did not last very long! (a total of 10 days!) The Sleek Pout Paints were released on August 3rd and come in 11 shades, including white (for lightening colours) and blue (for making colours deeper/darker). 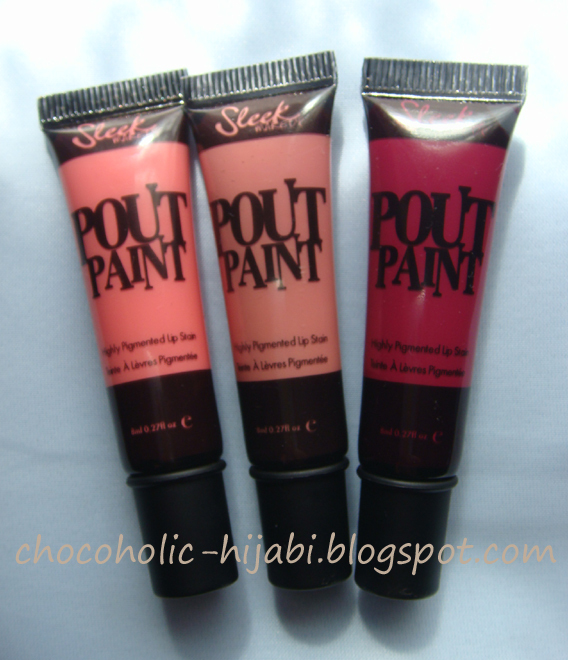 The idea behind pout paints is that you custom mix the paints to create your own shades. This is great for whether you want your own personal shade that you can't seem to find anywhere else, or just to bring out a more artisitic side of your personality. They are currently on offer in Superdrug on 3for2, and are individually priced at £4.99. Personally, I can see these lasting me a very long time, as I'm not a big fan of bold lip coloours, so I'll be using minimal amounts (even less than you would need normally) to apply a tint to the lips, as opposed to full on colour. All of the pout paints are super pigmented which makes them opaque, however they do stain, so you'll need an oil-based makeup remover to get rid of all the colour. I really wish that Sleek come out with some sort of mixing palette, because you really don't want to mix these on the back of your hand! Hopefully will get some swatches of what they look like when they're mixed with each other. What do you think of the pout paints?